Mailing to a list of sellers that provided owner financing is a proven method for cultivating deals that earn commissions from note investors. 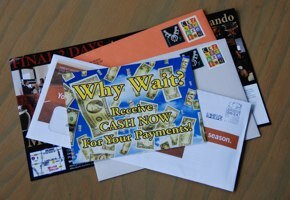 But what are the best criteria for targeting a direct mail campaign in the current economic environment? This type of question flooded the email inbox after writing about the list services of Fidelity National Data Service in the article entitled Where Can I Find Owner Financed Notes? Rather than waste valuable marketing dollars, note brokers understandably want to target leads that are most likely to be purchased by a note investor. First we must acknowledge that the tightening credit market, increasing foreclosures, and the declining real estate values have resulted in more restrictive underwriting. Investors are being careful when it comes to credit, equity, seasoning, and property type. It’s usually best to start a marketing campaign in your own county or state. People generally respond better to someone in their own “backyard.” As you venture out to other areas keep in mind that some states have experienced value declines of 30% or more. Consider targeting areas or deals that are less likely to have severe value issues. It is easier to find investors willing to purchase notes secured by residential and commercial properties. Unless you have a strong investor lined up for land or mobile home deals it is best to avoid marketing for them. There are pros and cons for marketing to both new and well-seasoned notes. While notes under 6 months old will be harder to sell to investors they are also more likely to have a sale price that reflects a current market value for the property. There are also benefits to educating and marketing your services to a note holder right away. It’s best to keep the amount-financed range in the middle right now, generally $50,000 to $750,000. Niche marketing to small notes is usually best left to a private investor while notes nearing one million or more will take very deep pockets. First Position only please! Don’t waste your marketing dollars on second liens. Target seller carry backs only and avoid the bank or private party loans for now. Request the list be “deduped” meaning any duplicate note seller names are removed by the list provider. Double check this has been done be resorting the list by the seller/lender name. While it is nice to target repeat sellers it doesn’t make dollars and cents to pay for the name and postage twice. The ability to select list criteria is one of the benefits of direct mail. If you know the sales price and loan amount it is even possible to target mailings to deals with a certain equity amount. Marketing preferences can be personal and what works great for one is not always a guarantee of success for another. Just keep in mind that the list criteria selected will play an important role in the closing success of a direct mail marketing campaign. Money will be spent on the name, postage, and postcard or letter so it makes sense to target your marketing dollars on transactions with a greater likelihood of turning into a closed transaction! Great info on your site. Most (newer) and less experienced note brokers do not exploit the direct mailing tactic to their benefit. I mostly come across note brokers that primarily target note sellers on the internet (via PPC or an organic tactic). From my experience, in order to make six figures a year, direct mail marketing is a must (in conjunction with other advertising tactics). The key is to diversify you advertising portfolio in order to blanket the market with your services.